It was still dark when I left the caravan and walked down to the water’s edge at the lake. First light was just breaking and I watched the colour in the sky change until the sun broke over the horizon. The vapour trails from the jet streams of the high flying aircraft put lines across the colours of the sunrise spoiling the effect of the beauty that had been provided by Mother Nature herself. The birds were out in abundance. The lake appeared to attract them from the wilderness that surrounded it. Parrots and cockatoo’s searched for seed on the ground while Red Caped Plovers and Masked Laspwings fossicked along the shoreline to try and beat the seagulls, that were there in large numbers, from finding the first tasty morsels for the day. Swallows plucked insects from the air while a pair of Brown Tree-creepers searched the trunks of the trees for their breakfast. As I walked back to the van a family of rabbits scatted for the security of their warrens as I approached. 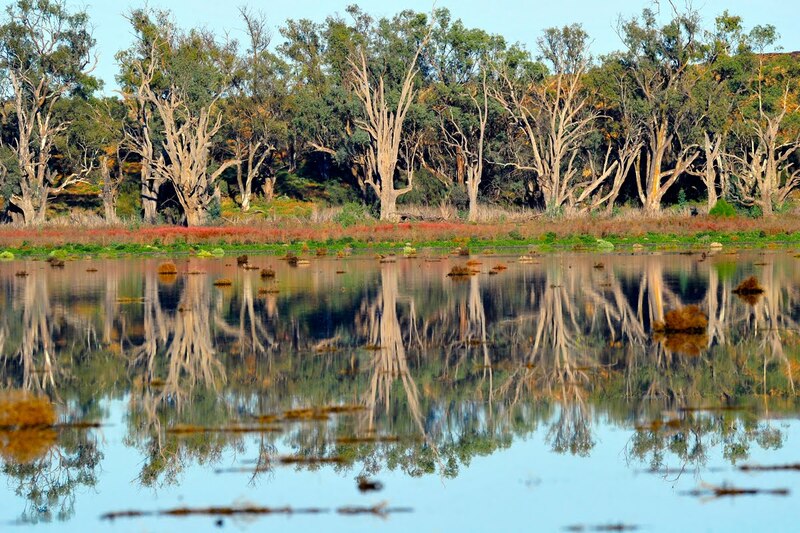 From Lake Benanee to Mildura was a leisurely hour’s drive. On our arrival we booked into a van park on the NSW side of the river and unhooked the van to make it easier for us to negotiate the city traffic and find parking places. 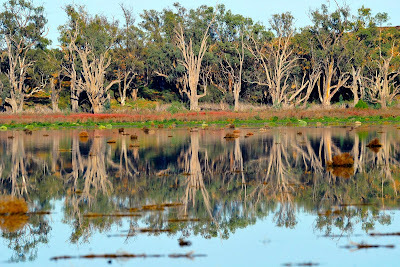 We had decided to spend some time in Mildura and check out the place. The city of Mildura is in Victoria, across the Murray River. 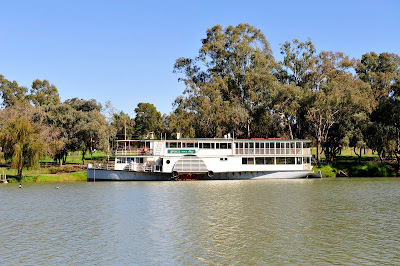 Steam paddle boats still work from this river port but today it is only to take tourist on a river cruise. After exploring the town, I left Coba at the caravan while I went to explore the Etiwanda Wetlands which used to be the sewerage ponds before they were transformed into a wetland centre. I think that this project must be reasonably new as they are still doing the roadwork in the reserve. Birdlife had not appeared to have taken to this area or today was a day out for them. There was one Black Swan, one Australian Grebe, one Yellow-billed Spoonbill, four Australian Shellducks, three Pied Cormorants and several Wood Ducks. A poor display for a wetlands centre. We had considered staying a couple of days here but in the morning we will make our decision on whether we stay or move on.